An arts student from a north Bengal school has topped the West Bengal higher secondary examinations this year, scoring 496 marks out of 500. 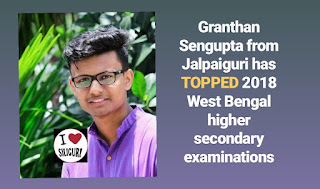 Granthan Sengupta from Jalpaiguri Zilla School in Jalpaiguri district beat students from fancied schools, urban and rural, elsewhere in the state to take the crown for the Class XII examinations. Granthan also becomes the first arts stream student to top the examination in the last five years, with his score of 99.2 per cent. Ritvick Kumar Sahoo of Tamluk Hamilton School secured second rank with 98.6 percent marks, a 493 out of 500 . Timir Baron Das and Saswata Roy both came third, securing 490 marks. Among the girls, Arkadipta Ghosh and Anima Garai jointly secured the first spot having scored 97.2 percent each. Both ranked fifth overall. While Ghosh is from Jadavpur Vidyapith, Garai appeared for the exams from Bankura Ranibandh School. The West Bengal Council of Higher Secondary Education said on Friday the overall pass percentage was 83.75 per cent, with 6,63,516 of the 8.09 lakh students who wrote the examination clearing it. The results were put up on the board's websites, wbresults.nic.in or wbbse.org, at 10.30am on Friday. Mark-sheets and other relevant documents can be collected from their respective distribution camps from 10.30 am onwards.